The PANTONE PLUS SERIES CMYK Colour Guide Set Coated & Uncoated offers 2,868 chromatically arranged CMYK colour combinations on coated and uncoated stock, in the two separate volumes that make up this set. Accurately select, specify and communicate colour for four-colour process printing, see the effect of coated and uncoated stocks against each other and enjoy a printed standard for colour comparison and quality control. These guides are ideal for use with PANTONE Formula Guide. The Pantone plus series CMYK Colour Guide Set Coated and Uncoated offers 2,868 chromatically arranged CMYK colour combinations on coated and uncoated stock, in the two separate volumes that make up this set. 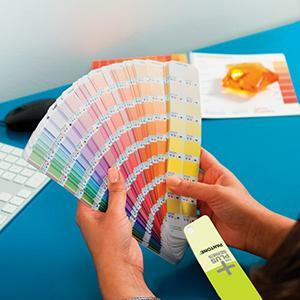 The Pantone CMYK Colour Guide Set is the ideal way to visualise, communicate and control colours within any graphics, print or creative project, with screen tint percentages also provided to enable accurate colour reproduction. Accurately select, specify and communicate colour for four-colour process printing, see the effect of coated and uncoated stocks against each other and enjoy a printed standard for colour comparison and quality control. This product does not contain any of the Pantone spot colours, and is entirely made up of CMYK colour variations. For Pantone Spot Colours alongside their closest CMYK equivalent please see Pantone ColourBridge Set and for Ink Mixing Recipes go to the Pantone Formula Guide.